Regional Office within ten days from the closing date. CGO Complex, Lodhi Road, New Delhi-110003. These vacancies are Group ‘B’ & Group‘C’,Non-Gazetted & Non- Ministerial. Initial Place Of Posting of Selected candidates depends on the post applied for. Separate Educational Eligibility for posts with minimum Educational Qualification of Matriculation, Higher Secondary and Graduation and above levels. Age : 18 - 30 years. The Government has dispensed with Interviews for Junior Level Posts. Accordingly, recruitment to Selection Posts will be made through Written Examination in Computer Based Mode consisting of Objective Type Multiple Choice Questions. There will be Computer Based Mode of Examinations consisting of Objective/Multiple Choice Questions, separately for posts with minimum Educational Qualification of Matriculation, Higher Secondary and Graduation and above levels. 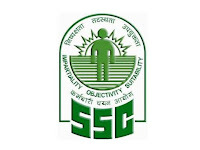 Only those Applications successfully filled through the Website http://ssconline.nic.in and Print out of Online Application along with all the required documents received in the concerned SSC Regional Office within ten days from the closing date. Procedure for Online Submission of Application consists of two stages–(i) Registration Part &(ii) Application Part. Rs. 100/- (Rupees Hundred only) through “SBI Net-Banking/Credit Cards/Debit Cards of all Banks” or through SBI Challan. Fee paid through any other mode will NOT be accepted. Fee once paid will not be refunded under any circumstances. Fee should be paid separately for each category of post applied. All Women candidates and candidates belonging to Scheduled Castes, Scheduled Tribes, Physically Handicapped and Ex-Servicemen eligible for reservation, are exempted from paying application fee, as per extant government orders.